This is the North Tower that is above the hotel. The pool ‘Wet’ with bar service, is shared with hotel guests. When you essentially live in the W Hotel, it’s hard to beat the amenities this property offers. The W prides itself on outstanding resident services - Whatever/Whenever. Walk to American Airlines Center for concerts and Mavericks and Stars games. Enjoy all the services as guests of W Hotel: spa, concierge, fitness center, laundry, catering, pet and plant care, housekeeping, etc. No pets for tenants. ° Additional Info: HOA dues are $1,488 monthly, 2 covered parking space(s), Dallas ISD. ° If you are looking for a life of luxury. 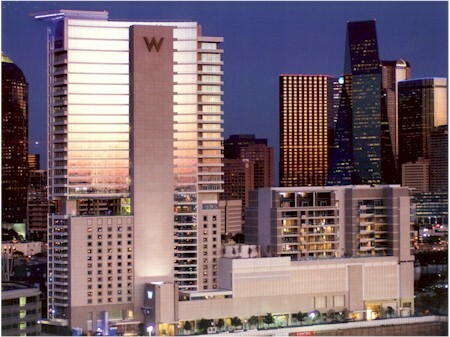 The W residence is the place for you. With incomparable services and a stunning panoramic view of downtown and uptown. 30 ft ceilings and walls of glass the view will simply take your breath away. Automation for TVs, music, HVAC, lighting, and shades. Master bath has all new Kohler appliances with a jetted tub that looks over downtown. New natural limestone honed vein cut floors throughout the house including bathroom showers. Along with new 100% New Zealand wool carpet. Low voltage specialty lighting in the kitchen, studio, and master bedroom as well as flos recessed magnetic track art lighting. Everything in this home is done to perfection and delivers pure bliss. ° Additional Info: HOA dues are $3,000 monthly, 2 covered parking space(s), Dallas ISD. ° Listing Agent: Jonathan Rosen, Compass RE Texas, LLC. The following units are listed for lease in W Dallas Victory Residences - 2430 as of April 20, 2019. ** Note that landlords may have more restrictive limits on pets than indicated above.